indirect evidence that neutrinos have mass, the first evidence of new physics beyond the standard model of Particle Physics. The standard three neutrino flavour mixing framework is well established and supported by a large amount of data from solar, atmospheric and accelerator data. Not all results, however, fit with the current three neutrino picture. A few anomalies in the very short baseline oscillation measurements and in some of the cosmological data analyses have emerged. The first hint came from the GALLEX and SAGE experiments which measured the rate of neutrinos coming from the sun in the 1980s and 1990s. A recent reanalysis have shown an unexplained (14±5)% deficit of recorded electron neutrinos which is called the Gallium anomaly. 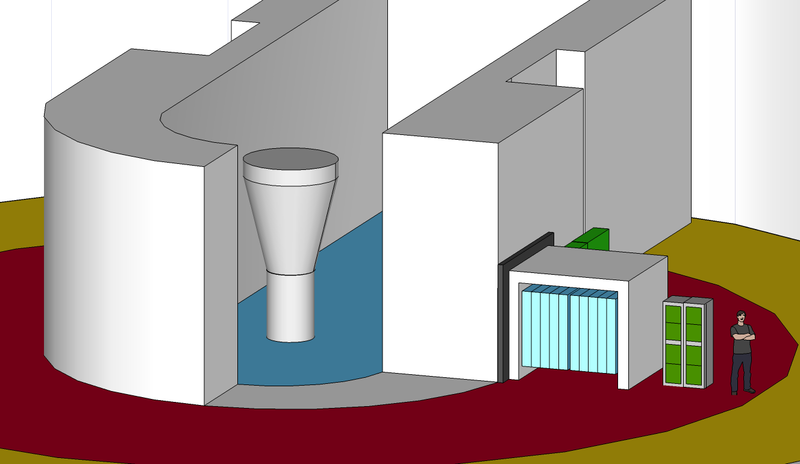 The second hint is more recent and arose from the need of a precise flux calculation for measuring the mixing angle θ13 using large detectors placed at 1km baseline from a nuclear reactor. Similar to the SAGE and GALLEX experiments, the observed rate of interactions is compared to a predicted rate, assuming no oscillation, given by calculations. Until about two years ago the data from reactor experiments agreed with the picture of oscillation between three neutrinos. The re-evaluation of the antineutrino flux resulted in an upward shift in the prediction of about 3% and this effect has been independently confirmed by other works. The effect of this shift, combined with off-equilibrium effect and updated neutron lifetime measurements has a statistical significance of 2.9σ in the ratio of measured-to-predicted anti-neutrino events (total effect is (7 .2±0.5)%). This deficit is called the reactor anomaly. The consequence of this is that all previous experiments measuring the anti-neutrino flux see a deficit. When combined, both anomalies disfavoured the no-oscillation hypothesis at 99.97% (3.6σ). The most popular explanation for these anomalies is a new light neutrino which oscillates with other neutrinos at short distances. This additional neutrino cannot, however, interact weakly like the other active neutrinos since only three neutrinos have been found to couple to the Z boson in the LEP collider missing mass measurements at CERN. The only viable state for this new neutrino is to be "sterile" meaning that it doesn't interact through weak interaction like the others. The existence of such a particle would represent the most extraordinary discovery beyond the standard model. Indeed, sterile neutrinos represent a very different type of new physics not investigated in mainstream high-energy experiments and would have far reaching consequences across disciplines. On the other hand, an improved upper limit on their existence using reactor data will seriously weaken - if not rule out - the light sterile neutrino hypothesis as an explanation for these anomalies. 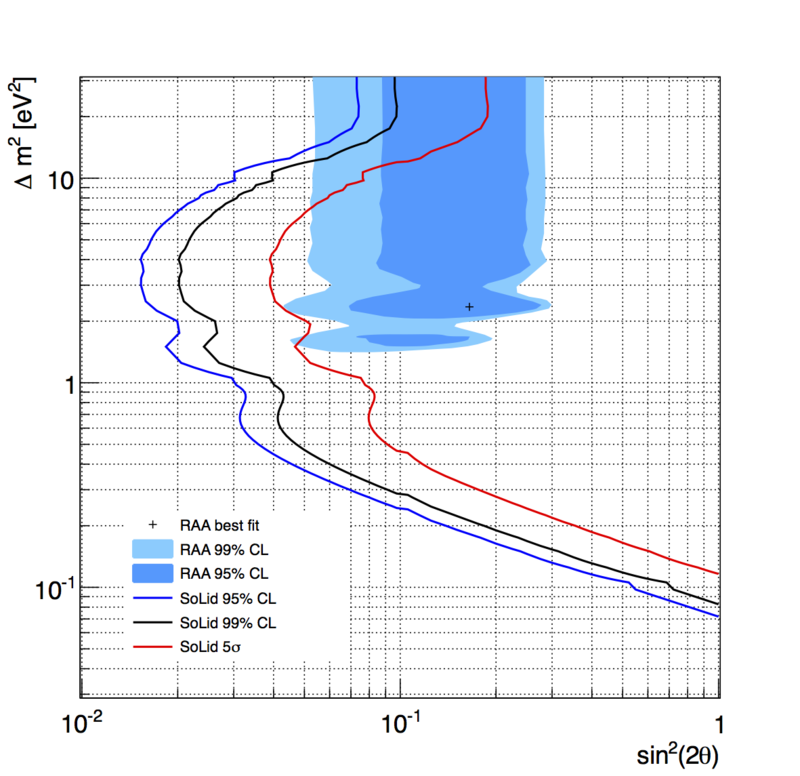 Furthermore this new experiment will, independently of the outcome, help with improving the accuracy of the reactor antineutrino flux calculation, a important input for future experiments using reactors as anti-neutrino sources. We propose with SoLid to improve the search for oscillation at very short distance from a research reactor as the most direct and timely way to prove or reject the existence of sterile neutrinos. This new measurement will use an improved experimental set up which has unprecedented sensitivity to new oscillation. A very short baseline reactor experiment can, by measuring the anti-neutrino energy spectrum at different distances, unambiguously identify the oscillation pattern and can give direct evidence for an active-to-sterile neutrino oscillation with minimal dependence on the neutrino flux. SoLid aims to measure the anti-neutrino rate and spectrum with a two detectors baseline (placed between 6m and 10m away from a compact nuclear reactor core) to search for disappearance of electron anti-neutrino via the inverse beta-decay reaction on Hydrogen: νe + p → n + e+ (Eν > 1.81 MeV). The BR2 MTR research reactor in Mol, Belgium is the perfect site to conduct such an experiment. It has one of the smallest reactor core providing a near point-like source which enables high resolution on oscillation patterns and powerful enough to accumulate sufficient number of neutrino interactions per day. To achieve the best possible measurement the SoLid experiment employes a highly segmented plastic scintillator detector developed to be robust to backgrounds by design. Indeed, the main challenge of this measurement is to control the high level of backgrounds present close to reactor cores. The SoLid detector provides unique gamma-neutron discrimination by using an innovative sandwich of plastic and 6LiF:ZnS(Ag) scintillator. In addition, the segmentation provides a very good localisation of interactions giving superior capability to reject backgrounds compared to alternative designs using Gd to detect the neutrons. This unique approach can provide the most accurate measurement with the highest possible signal to backgrounds ratio central to translate current anomalies into a robust measurement. With an expected 41% efficiency and 2 years running from early 2016 (300 days/year) a total of 250k events can be collected - sufficient to cover the current reactor anomaly region below 5 eV2 at better than 99% C.L- by end of 2017. K Abe, N Abgrall, H Aihara et al. A Vacheret, GJ Barker, M Dziewiecki et al. D Orme, N Nagai, A Minamino et al. A Cabrera, P Adamson, M Barker et al. M Yokoyama, T Nakaya, S Gomi et al. F Retière, Y Du, S Foreman et al. A Minamino, N Nagai, D Orme et al. DG Michael, P Adamson, T Alexopoulos et al. A Vacheret, S Greenwood, M Noy et al. AJ Weber, P. Adamson, G. Crone et al. K Lang, J Day, S Eilerts et al.